Financial Management means planning, organizing, directing and controlling the financial activities such as procurement of funds in the most economic manner and employment of those funds in the most optimum way. 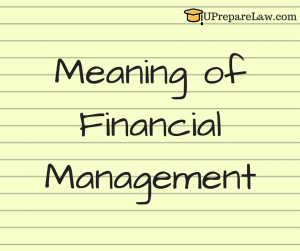 It means applying general management principles to financial resources of the enterprise. Financial Decisions relate to the raising of funds from various resources. It depends on the type of source ( debt or equity ), the period of financing, cost of financing and the returns thereby. Investment Decisions includes investment in fixed assets ( known as capital budgeting ). Investment in current assets ( working capital ) is also a part of investment decision. The dividend for Shareholders: Dividend and the rate of the dividend need to be decided. Retained Earnings: Amount of retained profits has to be finalized which will depend upon expansion and diversification plans of the enterprise. 1. Estimation of Capital Requirement: Estimation depends upon expected costs, profits, future programs and policies of a firm. Estimation must be adequate, as it can increase the earning capacity of the firm. 2. Determination of Capital Composition: It is based on long term-short term debt equity analysis. This will depend upon the proportion of equity capital a company is processing and additional funds which have to be raised from outside parties. 4. Investment of Funds: Financial Manager has to decide to allocate funds into profitable ventures so that there is safety on investment and regular returns are possible. 5. Disposal of surplus: It refers to the decisions on the net profits made about the dividend declaration and retained earnings. 6. Management of cash: The Financial manager has to make decisions with regards to cash management. It is required for many purposes like payment of wages and salaries, bills, creditors, maintenance of stock, raw materials, etc. 7. Financial Control: Financial Manager not only has to plan, procure and utilize funds but he also has to exercise control over finances. This can be done through many techniques like ratio analysis, financial forecasting, cost and profit control, etc. 1. Wealth Maximization : The one of the most important objective of financial managers is to maximize the value of shares of their shareholders. 3. Focus on stakeholders: Stakeholders are those entities who have invested in shares and the interest of those people that a firm can’t ignore.